We will meet in Ely, Minnesota at 3 p.m at our outfitters, Voyageur North. 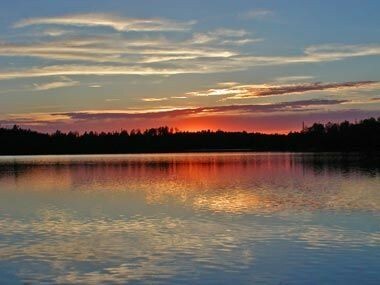 The Boundary Waters Canoe Area (BWCA) has over a thousand sun-kissed lakes, hundreds of miles of rivers and streams, a million acres of boreal forest, abundant wildlife, superb fishing, over 1,500 miles of canoe routes, and some of the best flat-water paddling in North America. 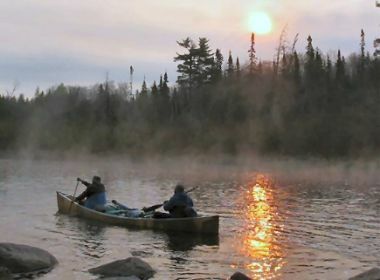 National Geographic named the Boundary Waters as one of 50 destinations of a lifetime. Each year, visitors come from all over the world to sample this maze of waterways, and few go away disappointed. We will spend an entire week experiencing the stillness, silence, and solitude of this amazing area, while paddling the pristine waters of the BWCA. You will paddle among towering red and white pines, white birches, and beautiful bogs in the home of moose, lynx, and the eastern timber wolf. You will wake to watch the rising sun burn mist off of a mirror-still lake, while you hear the call of the loon in the background. Amazing sunsets will greet you as daylight dwindles away, and you may even be lucky enough to hear the distant howl of wolves in the darkness. The BWCA is located on the U.S.-Canada border. Along with Voyagers National Park to the west and the Canadian Quetico and La Verendrye Provincial Parks to the north, they make up a large area of over 2.5 million acres called the Quetico-Superior country, or simply the Boundary Waters. The BWCA and Quetico Provincial Park stretch for nearly 160 miles between Minnesota and Ontario. Within the BWCA are hundreds of prehistoric pictographs and petroglyphs on rock ledges and cliffs. The area was sparsely populated by the Sioux and Chippewa, who dispersed westward following the arrival of the Ojibwe. The Grand Portage Indian Reservation, just east of the BWCA at the settlement of Grand Portage, is home to a number of Ojibwe to this day. In 1688, the French explorer Jaques de Noyon became the first European known to have traveled through the Boundary Waters. Later during the 1730s, La Verendrye and others opened the region to trade, mainly in beaver pelts. Every fall from about 1750 until the mid-1800s, French-Canadian traders known as the Voyagers carried trade goods through the Boundary Waters, as far as the Great Slave Lake in Canada's Northwest Territories. They spent the winter in the interior trading with the Native Americans. When the ice went out of the lakes and rivers, they returned with beaver and other pelts. In fact, the Voyagers route through the Boundary waters defines the present day U.S.-Canada border. We'll travel through some of the same water routes that were used by the Sioux, Chippewa, and French-Canadian Voyagers. The Wilderness Act of 1964 made the BWCA legal wilderness as a unit of the National Wilderness Preservation System, while the 1978 BWCA Act established the Boundary Waters regulations much as they are today, with motors allowed only on a few large entry-point lakes. The lakes and landscapes of the BWCA were gouged and carved out of three-billion-year-old rock by two-mile-thick glaciers that covered this area roughly one million years ago. The lakes are essentially the liquid remains of this gouging, while the three-billion-year-old exposed bedrock is now some of the oldest exposed rock in the United States. We will see many dramatic rock structures among the lakes and streams and, if we look closely, we may be able to see some of the grooves in the rock left by the glaciers. Located about two hours north of Duluth, Minnesota, the BWCA is on the southern edge of the Canadian Shield, a vast exposure of Precambrian stone that sweeps from eastern Manitoba to the Atlantic Ocean. Lake Superior is located just to the south, which generates a chilly microclimate. Forests and plains are therefore more typical of those found farther north -- vast stretches of black spruce, balsam fir, and jack pine. Owing to its position on the edge of several eco-types, the southern part of the Boundary Waters also has trees of the northern hardwood forest -- birch, aspen, maple, and Norway and White Pine. The unofficial mascot of the BWCA is the common loon, who will likely enchant us with a serenade. Birding in the boreal forest of the BWCA is a very unique experience. You might also see bald eagles, ospreys, Canadian jays, warblers, flycatchers, grouse, and woodpeckers. The BWCA is home to a significant number of timber wolves, the last large packs in the lower 48 states. The odds are much greater that you'll hear a wolf rather than see one, and the experience is exciting. While wolves may howl at any time, frequency increases an hour or so after darkness, and again just at sunrise. Moose, by contrast, are plentiful and among the most commonly spotted large mammals -- especially in the slow-moving waterways filled with water lilies, which the moose love to munch on. The forests of the BWCA are also home to one of North America's largest carnivores, the black bear. As we canoe, we will carefully scan semi-open hillsides that may harbor blackberries, raspberries, or blueberries, which are favorite late-summer foods for the black bear. Waterways near younger forest are prime locations for spotting the ever-busy beaver and we will likely pass telltale signs of its presence, such as mounded lodges of sticks along banks and dams that cross creeks. Otters sometimes approach the quiet canoeist, curiously emerging from the water mere yards away. There are also white-tailed deer, fox, mink, fishers, and lynx within the BWCA. Fishing in the BWCA can be some of the best anywhere. Game species include northern pike, walleye, largemouth and smallmouth bass, yellow perch, whitefish, and even rainbow and brook trout in some lakes. The wildlife experiences in the BWCA are frequently intimate and usually unexpected, making them that much more special. Day 1 — We will meet in Ely, Minnesota at 3 p.m at our outfitters, Voyageur North. (http://www.vnorth.com/). We will do introductions, review group gear and packing, and give a brief canoe paddling and portaging refresher -- hopefully on the water. We will go to a local restaurant for a group dinner, which is not included in the trip price. We have a group bunkhouse available to spend the night. Day 2-6 — After an early breakfast, we paddle into the backcountry! 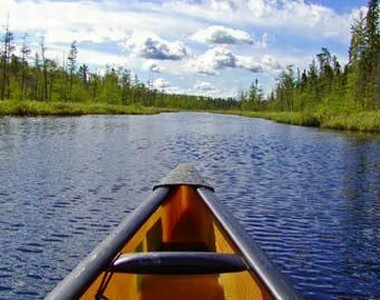 We will spend the next several days canoeing and exploring the lakes, streams, and rivers of the BWCA. These lakes and rivers are connected by portage trails. We will camp at established single-party campsites with fire rings and latrines. There will be ample free time for fishing, hiking, wildlife viewing, taking photos, or just relaxing. For those wanting to fish, popular lures include rapalas, jigs, and spoons, as well as live bait. Multi-sectioned or collapsible fishing rods are best for ease in carrying while portaging. In order to fish, you will need to purchase a seven-day Minnesota Fishing License, which costs about $25 at local Ely stores. Waterproof cameras are your best choice for capturing pictures, while binoculars are a great tool for wildlife viewing. Day 7 — We will paddle out of the backcountry and be back in Ely sometime in the afternoon. We will have showers and a group bunkhouse available to spend the night. A group dinner in Ely is tentatively planned, which is not included in the trip price. Ely, Minnesota will be our jumping-off point for the BWCA. While Duluth, Minnesota is the closest city with a major airport, most people fly into Minneapolis-St Paul, Minnesota, as it generally has much lower airfares and offers many more scheduled and direct flights. From Minneapolis to Ely, it is roughly 250 miles and a four- to five-hour scenic drive. Everyone will receive a participant contact list and participants are encouraged to carpool and share rental cars. In close proximity to Ely, there are numerous waterways, hiking trails, and outdoor activities available, as well as the outstanding International Wolf Center. Ely is a great place to spend an extra day or two before or after the outing. A shared bunkhouse cabin on day one and day seven of the outing is included in the trip price. You may also choose to reserve your own hotel if you would like more privacy. Backcountry campsites will be utilized on days two to six. Meals start with breakfast on day two and end with lunch on day seven. Participants will take turns with cooking and camp chores. We will likely go out to dinner as a group at a local Ely restaurant on day one and day seven of the outing. These two dinners are not included in the trip price. The average high temperature in August is 75 degrees; the average low is 52; and the average rainfall for the month is three inches. Good raingear and footwear are essential. We will be on flat water, including river portions of the trip. Canoe partners should be able to manage a canoe in at least light wind and small waves. Current is generally minimal and we will portage around any rapids or waterfalls. The most strenuous activity we will encounter is portaging. 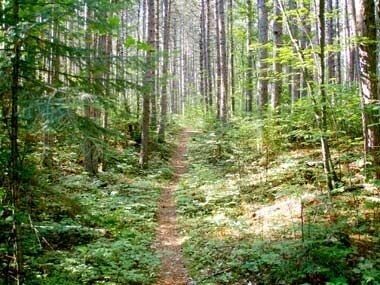 Portage trails can vary in length from a few yards to a quarter mile or more. The terrain may be flat, hilly, dry, wet, rocky, or slippery and canoes may range from 40-60 lbs. Being in good shape will help you portage with a minimum of discomfort and will help you avoid any injuries. We plan on paddling an intermediate level route through the BWCA. We will be on the water and in transit/portaging from 4-6 hours per day, and paddling 8-12 miles per day. This may vary depending on wind, weather, and other factors. You need not be an expert, but should have some previous canoeing and camping experience. By the same token, experienced paddlers will still greatly enjoy this trip. We will provide rental canoes, PFDs, paddles, group cooking gear, and food. You are also welcome to bring your own favorite PFD or paddle. You will need to provide your camping gear (tents, sleeping bags, etc), dry bags (one big pack and one small pack), and your personal dining gear. We will go over and distribute group gear to participants on day one of the outing. All gear must fit into packs, as loose items are easy to lose and can turn an easy portage into a major challenge. Dry bags and good rain gear are essential items. Synthetics and layers of clothing are the best route to go. Cotton clothing does not retain heat once it gets wet. A full equipment list will be sent to all confirmed participants prior to the outing. Feel free to bring along fishing gear, just remember that you'll have to pack it on portages-collapsible backcountry fishing poles work best. You will also need to purchase a seven-day Minnesota Fishing License, which costs about $25 at local stores. With prior notice, camping, dry bags, packs, and other gear can be rented through the local outfitter that we are renting canoes, etc. from. There are also other numerous outfitters located in Ely, Minnesota. Please contact leader for more information. -Boundary Waters Canoe Area: The Eastern Region; Robert Beymer; Wilderness Press; 2009. -Boundary Waters: Canoe Camping With Style; Cliff Jacobson; Globe Pequot Press; 2001. -Canoe Country Camping: Skills for the Boundary Waters and Quetico; Michael Furtman; University of Minnesota Press; 2002. -Canoe Country Flora: Plants and Trees of the Boundary Waters; Mark Stensaas; University of Minnesota Press; 2004. -Canoe Country Wildlife: A Guide to the Boundary Waters and Quetico; Mark Stensaas; University of Minnesota Press; 2001. Unsafe sulfide mining is one of the biggest threats to the pristine BWCA Wilderness. Sulfide mining is new to Minnesota, but elsewhere in the country (particularly in the Western U.S.) it has polluted water with acid mine drainage and left taxpayers responsible for hundreds of millions of dollars in cleanup costs when mining companies have filed for bankruptcy and abandoned their polluted mines. With sulfide mining companies seeking permits from the Minnesota Department of Natural resources and exploration for more sulfide mines occurring throughout the Arrowhead region, laws are needed to protect Minnesotans from problems experienced in other states. While other states have passed similar legislation only after experiencing the devastating effects of sulfide mining disasters, Minnesota has a chance to lead on the issue, preventing problems before they occur. The "Safe Mines to Protect Our Water" legislation, introduced in 2009 by Rep. Alice Hausman (DFL-St. Paul) and Senator Jim Carlson (DFL-Eagan), would ensure that mining companies are required to provide sufficient financial assurance to the state and that their mines are clean and non-polluting when mining is done. If passed, Senate Bill SF 084 and House HF 0916 would not be a moratorium on sulfide mining. The legislation seeks to ensure that mining is done right and that mines are modern, model operations that will not leave a legacy of pollution or expensive cleanup bills for taxpayers. Without protective standards in place, mine waste from sulfide mines could be a toxic problem for hundreds of years. Acidic runoff loaded with toxic metals could threaten the neighboring lakes, rivers, and streams of the BWCA Wilderness and Lake Superior watersheds.